This tutorial will help you to create SFTP only user (without ssh access) on Ubuntu systems. The user can connect the server with SFTP access only and allowed to access the specified directory. User can’t SSH into the server. Follow the below tutorial to create sftp only account. First of all, create a user account to use for sftp access. Below command will create user named sftpuser with no shell access. Now, create the directory structure to be accessible by sftp user. Change the ownership of the files directory to sftp user. So that sftpuser can read and write on this directory. And set the owner and group owner of the /var/sftp to root. The root user has read/write access on this access. Group member and other account have only read and execute permissions. and add the following settings at end of file. Save the configuration and restart SSH service to apply changes. 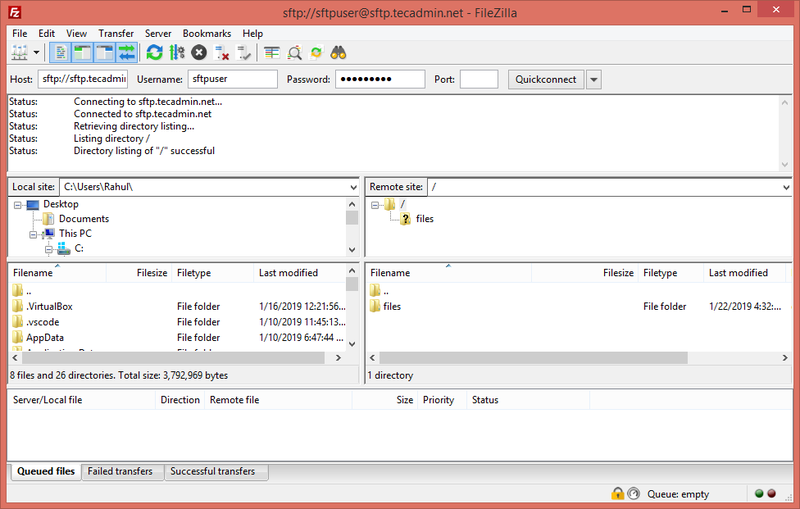 I am using FileZilla for the connection to SFTP instance from my Windows systems. Linux desktop users can also use Filezilla for connection. For Linux server, users can use sftp command line utility to connect to remote sftp instance. This service allows sftp connections only.